BACKGROUND AND PURPOSE: Thromboembolic events may occur during or after the treatment of intracranial aneurysms with Guglielmi detachable coils (GDCs). The purpose of this study was to determine the frequency of thromboembolic events associated with balloon-assisted coil placement and to investigate possible risk factors for these events during balloon-assisted coil placement and embolization. METHODS: Twenty patients with cerebral aneurysms treated with balloon-assisted coil placement and embolization at our institution were included. All patients underwent diffusion-weighted (DW) imaging within 6 hours after the procedure. Two neuroradiologists reviewed all DW images to detect ischemic lesions. RESULTS: Hyperintense lesions compatible with thromboembolic events were detected on DW images of four (20%) patients. Three lesions were in the territory of posterior circulation, and one was in the territory of anterior circulation. The occurrence of new lesions was strongly associated with the number of times the microcatheter or coil was repositioned and removed and with the size of the aneurysmal neck (P < .01). DW imaging findings did not suggest a strong correlation between the occurrence of new ischemic lesions and potential risk factors (maximum balloon inflation time, number of times the balloon was inflated, etc.) associated with balloon-assisted coil placement and embolization (P > .05). CONCLUSION: The risk of thromboembolic events during the treatment of intracranial aneurysms with balloon-assisted techniques is not more significant than when conventional GDC techniques are used. The only variables found to influence this risk during or after balloon-assisted coil placement were microcatheter repositioning, coil removal and repositioning, and size of the aneurysmal neck. The treatment of intracranial aneurysms with endovascular coils has become an important and well-known alternative to surgical clip placement (1–3). Although this treatment does represent a useful option for the treatment of certain types of complicated aneurysms, wide-necked or broad-based aneurysms with a maximal sac diameter-to-neck size ratio of close to 1 are still complicated to embolize because of the risk of coil migration or coil protrusion into the parent vessel (4). The neck remodeling or balloon-assisted embolization technique originally described by Moret et al (5) has been used in the endovascular treatment of wide-necked aneurysms or in aneurysms with an unfavorable neck-to-fundus ratio in which a standard coil placement technique may be unsuccessful. Potential complications associated with balloon-assisted embolization techniques, such as thromboembolic events, vasospasm, perforator occlusion, dissection, and ruptures of the parent artery or aneurysmal sac, have been described in the literature (6–11). The most frequent and serious complications of both balloon-assisted and conventional coil embolization are thromboembolic events and secondary ischemic lesions (6–11). The incidence of thromboembolic events resulting from conventional coil embolization procedures is established (12–15); however, no consensus about the risk of thromboembolic complications resulting from balloon-assisted procedures has been reached. Theoretically, the use of balloon-assisted techniques could increase the risk of thromboembolic complications. The technique requires that two microcatheters be introduced into the artery, that the parent artery be temporarily occluded, and that the balloon be repeatedly inflated and deflated. Because of these factors, some authors have suggested that balloon-assisted techniques carry a risk greater than that of conventional Guglielmi detachable coil (GDC) procedures (10, 11); however, others (5, 9) have reported lower rates of thromboembolic complication when balloon-assisted embolization techniques are used. The purpose of this study was to evaluate the frequency of thromboembolic events resulting from balloon-assisted embolization by using diffusion-weighted (DW) imaging. In addition, we attempted to determine whether any anatomic or technical factors contributed to an increased risk of thromboembolic events during these procedures. All patients referred to our institution for endovascular coil placement of cerebral aneurysms between June 2002 and February 2003 were prospectively evaluated. Total referrals were 67. Seventeen of the 67 patients (four men,13 women) were enrolled. Their ages ranged from 34 to 67 years (mean age, 49.25 years). If any patient underwent balloon-assisted embolization during this period, he or she was included. Patients who underwent parent-artery occlusion, stent or stent-graft or conventional GDC procedures (without a balloon) were excluded. If two aneurysms were located at the same parent artery, these patients were also excluded. If a vasospasm secondary to subarachnoid hemorrhage (SAH) was detected during preprocedural angiographies, the patients were also were excluded. Each patient underwent a complete and detailed neurologic examination, performed by a stroke neurologist before and immediately after the embolization and immediately after DW imaging. New neurologic deficits were noted. Patients were monitored closely in the neuroscience intensive care unit for any clinical changes during the first 24–48 hours after the procedure was performed. The aneurysms treated were at the following locations: basilar bifurcation (n = 2), basilar artery (BA)–superior cerebellar artery (SCA) junction (n = 5), internal carotid–paraclinoid/paraophtalmic segment (n = 9), internal carotid–superior hypophyseal segment (n = 2) internal carotid–cavernous portion (n = 1), and internal carotid artery (ICA) bifurcation (n = 1). The size, neck diameter, and fundus-to-neck ratio of the aneurysm were measured. A wide-necked aneurysm was defined as one having a neck diameter >4 mm or a low fundus-to-neck ratio (close to 1 or <1.5). All procedures were conducted with the patient under general anesthesia. Cerebral angiography was performed to evaluate the morphologic features of the aneurysm and parent vessel and the collateral blood supply to the vascular networks placed at risk by the proposed balloon occlusion. This initial angiography procedure also helped establish the optimal visual working projection for coil occlusion of the aneurysm. The presence or absence of the ipsilateral posterior communicating artery (PCoA) and anterior communicating artery (ACoA) was also noted. Aneurysmal occlusion by GDCs was classified as complete (no opacification of the aneurysm evident on the post treatment angiogram, nearly complete (coils present throughout the aneurysm but minor opacification visible through the interstices of neck region coils on the post-treatment angiogram), or subtotal (coils not present in a portion of the aneurysm appearing as opacified on the post-treatment angiogram). 7F and 6F femoral sheaths were inserted into both femoral arteries, and digital subtraction angiography was performed at the beginning of each procedure. The parent vessel was catheterized with a microcatheter (Excel 14, Excelsior 10–18, Target/Boston Scientific, Fremont, CA; Rapid Transit 18; Cordis, Miami Lakes, FL). placed near the aneurysmal neck. The calibers of the parent arteries and the size of the aneurysmal neck were approximately calculated, and a microballoon size was chosen on the basis of these calculations. A nondetachable balloon (Sentry 10–15 mm, Target/Boston Scientific, or Hyperglide, MicroTherapeutics Corp, Irvine, CA) was then advanced through the contra-lateral femoral sheath to the neck of the aneurysm. The microcatheter was advanced into the aneurysm dome, while the balloon was uninflated. Finally, the balloon was carefully inflated to occlude the aneurysmal neck, while the tip of the microcatheter was in a location in the body of the aneurysm that was suitable for GDC deposition. GDCs (Target/Boston Scientific) of appropriate diameter, length, and stiffness were deposited in the aneurysm dome and detached electrolytically. In every patient, a 1-mL precision injector with threaded plunger syringe (MicroTherapeutics) was used for balloon inflation. The microballoon was never inflated more than its nominal volume. Before the detachment of each coil, the balloon was slowly deflated so that the stability of the coil mass could be assessed. If the coil mass was stable (did not herniate out of the aneurysm sac into the parent artery), the coil was detached electrolytically. This process was repeated until the aneurysm was embolized as completely as possible. By the time the balloon was inflated at the end of the procedure, the microcatheter had always been withdrawn. For every patient, the following factors were carefully noted: the number of times the microcatheter or coil was removed or repositioned, the number of coils used, the number of balloon inflations, the length of time to inflate the balloons, the total time for which the balloon was inflated, and the amount of time the balloon stayed (in both the noninflated and inflated positions) in the intracranial circulatory network. We checked for any occlusion of the side arterial branches (anterior choroidal artery, ophthalmic artery, etc). Multiple angiographic runs were performed both during and after the procedure to monitor for thromboembolic events. If thromboembolic events were detected, mechanical and chemical thrombolysis was performed. All patients were given heparin 5000 IU before the procedure and heparin 1000 IU hourly during the procedure. Activating clotting times were not tested during procedure. The sheaths and guiding catheters were continuously flushed with an infusion of saline (no heparin). In all cases, systemic heparinization was not reversed, and the patients were transferred to the intensive care unit under systemic heparinization. If no thromboembolic events were detected and if the aneurysm was completely occluded, heparinization was stopped. If a risk for thromboembolic events was suspected, systemic heparinization was stopped 6 hours after the procedure, and low-molecular-weight heparin t was given for 3–5 days afterward. If a definite thromboembolic event occurred during the procedure, systemic heparinization was continued for 24 hours after the procedure and low-molecular-weight heparin was given for 3–5 days afterward. No antithrombin or antiplatelet agents were used for anticoagulation. DW imaging was performed with a 1.5-T system (Magnetom Symphony; Siemens, Erlangen, Germany), by using a multisection, single-shot, spin-echo echo-planar imaging sequence. Diffusion gradients were applied in each of the x, y, and z directions with three b values (0, 500, and 1000 s/mm2). The parameters were as follows: TR/TE, 3600/97; matrix, 128 × 128; field of view, 23 cm; section thickness, 5 mm; and intersection gap, 2.5 mm. Typically, we performed two repetitions to improve the signal intensity-to-noise ratio, resulting in a total imaging time of 54 seconds. ADC images were generated online from an MR imaging unit. Conventional T1- and T2-weighted spin-echo imaging with a fluid-attenuated inversion recovery (FLAIR) sequence was also performed at each examination. Because many of our patients were transferred directly to our angiographic suite from different institutions, baseline DW imaging could not be performed before the procedures. On the DW images, any signal-intensity abnormality was recorded. For all diffusion-weighted abnormalities, we identified the size, vascular distribution, lobe, and area of the brain in which the lesion was situated. All diffusion-weighted abnormalities were correlated with the findings of the T2-weighted and FLAIR images. Two neuroradiologists (H.S., B.K) who were unaware of the procedures performed evaluated all MR images. The association of hyperintense lesions with aneurysm diameter and neck size, fundus-to-neck ratio, number of coils used, maximum single-balloon and total balloon inflation times, number of times the balloon was inflated, time the microballoon remained in the parent artery, number of time the microcatheter was repositioned, and number of times the coil was removed or repositioned were tested with discriminate (stepwise) analysis. A P value of <0.05 was considered to indicate a significant association. Seventeen patients underwent 20 embolization procedures in 20 aneurysms. Two procedures were performed in two patients: One patient had two aneurysms affecting different parent arteries, and the second had a recurrence of the original aneurysm. Among the 10 patients who presented with headache, two additional aneurysms were incidentally found during endovascular treatment of the aneurysm that had already been identified. One patient with an aneurysm presented with recurrence. Hemorrhage occurred in seven patients: three of World Federation Neurologic Surgeon (WFNS) grade I, three of grade II, and one of grade III. The size of the aneurysms treated with intracranial balloon embolization ranged from 3 to 15 mm, with a mean size of 6.75 mm in the largest angiographic dimension. The size of the neck of the aneurysms ranged from 3 to 19 mm, with a mean of 4.6 mm. The fundus-to-neck ratio ranged from 1 to 2.5 mm, with an average of 1.44. Because every patient had either a wide-necked aneurysm or complicated morphologic factors, the balloon-assisted embolization technique was used in every case. The type and size of the intracranial balloons used are listed in Table 1. The nondetachable microballoon catheters used were the Equinox catheter (4 × 15 mm, MicroTherapeutics Corp) in one procedure, the Hyperglide catheter in four procedures (4 × 20 mm, MicroTherapeutics Corp), the Sentry-15 catheter (3.5 × 15 mm, Target/Boston Scientific) in four procedures, the Sentry-10 catheter (3.5 × 10 mm, Target/Boston Scientific) in 10 procedures, and Sentry-10 and Sentry-15 catheters in one procedure (two balloons used to treat a basilar-tip aneurysm). The arterial location of each balloon inflation is provided in Table 1. In all but one of the embolization procedures, in which the aneurysm was located in the anterior circulation network, the microballoon was inflated below the Willis polygon. For this procedure, the microballoon was inflated in the ICA bifurcation. In another patient, the balloon was inflated in the M1 segment of the middle cerebral artery (procedure 20), in an area distal to Willis polygon. In all cases in which the embolization procedure took place in the posterior circulation, the microballoon was inflated below the connection point of the PCoA to PCA. The configuration of the ACoA and PCoA is given in Table 1. Any temporarily occluded sidewalls or end branches of parent arteries that were encountered during the procedure are also documented in Table 1. For each procedure, Table 2 shows the number of times the microballoon was inflated (9.85 ± 4.1 times), the maximum (168 ± 73.2 seconds), minimum (26.5 ± 20 seconds) durations, and total length of inflation (750.1 ± 410 seconds), and the time the balloon remained in the parent artery (105.8 ± 34.3 minutes). The number of coils used (5 ± 3 coils), the number of times the microcatheter was repositioned (1 ± 1.75 times), and the number of times the coil was repositioned or removed (1.5 ± 2.1 times) are also listed in Table 2. During three (15%) of 20 procedures, thromboembolic events were detected on angiography. Thrombus formation was noted in the paraopthalmic segment of the ICA in one case (procedure 10). In this patient, thrombus formation was treated with mechanical and chemical thrombolysis. On awakening after the procedure, the patient had no signs of any additional neurologic deficits. In another case, SCA thrombosis occurred, and despite intensive chemical and mechanical thrombolysis, thrombus formation in this artery could not be eliminated (procedure 2, Fig 1A and B). This patient presented with dizziness after the procedure but completely recovered within weeks. This same patient underwent a second procedure to treat a recurrence of her aneurysm. During this procedure, right SCA-PCA thrombosis occurred. The PCA was opened by means of thrombolysis; however, the SCA was not opened during this procedure (procedure 14, Fig 1C and D). The patient presented with dizziness, diplopia, and dysmetria after the procedure, but she also completely recovered within weeks. A stroke neurologist evaluated this patient immediately after the operation and during the follow-up visits (at 1 and 2 weeks and at 1 and 3 months). The stroke neurologist did not detect any neurologic deficit during physical examination on these visits. Right vertebral AP arteriograms obtained in a 40-year-old woman with severe headache and a right SCA aneurysm. A, Image shows a wide-necked aneurysm of the right SCA. Distal portion of the SCA and its branches are seen clearly. 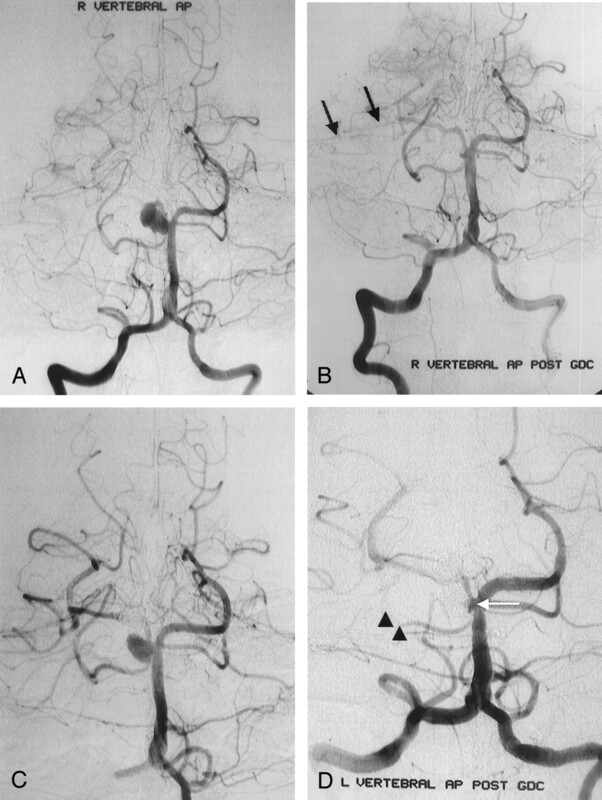 B, Immediate postembolization image shows nearly complete aneurysmal occlusion with coils, with a minimal neck remnant around the right SCA orifices. Distal portion of the SCA and its branches (arrows) are not seen clearly because of thromboembolic events during the procedure. C and D, Images from a second procedure. Image in C shows wide-necked aneurysmal recurrence of the right SCA 3 months after the first procedure. 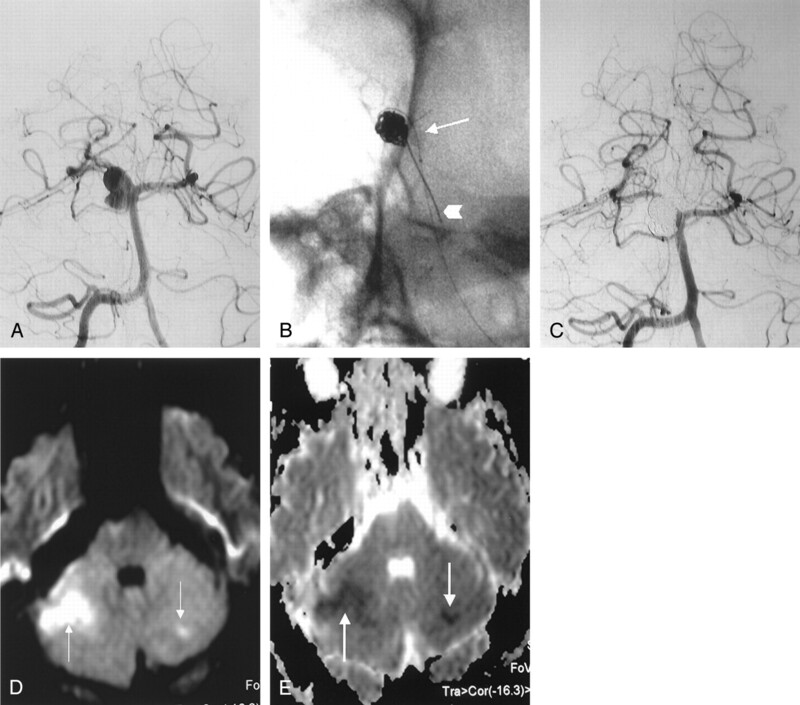 Immediate postembolization image in D shows nearly complete aneurysmal occlusion with coils, with minimal neck remnant around the right SCA orifices (arrow). Right SCA (arrowheads) is not seen clearly because of resistant thromboembolic event during the procedure. Two ischemic events were detected on DW imaging performed after procedure 7 (Fig 2) and procedure 20. No thromboembolic events were detected in these angiographic procedures. Before undergoing DW imaging and after the embolization procedures, one patient presented with dizziness, and the other presented with right-arm paresthesia. These symptoms were not present before the GDC procedure. The patients were treated with heparin overnight. Within a week, they recovered completely. The stroke neurologist did not detect any neurologic deficit during follow-up physical examinations. Images obtained in a 34-year-old man with SAH (grade 2) and a right SCA aneurysm. A, Right vertebral AP arteriogram shows a large, wide-necked aneurysm of the right SCA. B, Unsubtracted view shows the inflated microballoon at the neck of aneurysm (arrow) and microcatheter delivering the coil into the aneurysm (arrowhead). C, Immediate postembolization right vertebral AP arteriogram shows complete aneurysmal occlusion with coils. Distal portion of SCA and its branches are seen clearly without thromboembolic phenomena. D and E, DW image(D) and ADC map (E) 4 hours after the procedure show ischemic areas in the right and left SCA territories (arrows). Among the 20 aneurysms treated with balloon-assisted coil placement, occlusion was considered complete in 15 (75%), nearly complete in two (10%) and subtotal in two (10%) at the end of each procedure. In one case, treatment failed because it proved impossible to keep the microcatheter securely inside of the aneurysm (procedure 10). After DW imaging had been performed, no new neurologic symptoms were detected in any patient during the 24–48-hour hospitalization period. MR imaging was performed within 130–330 minutes (241.4 ± 67.5 minutes) of the procedures. In four (20%) of 20 patients, DW imaging revealed areas of restricted diffusion with corresponding low apparent diffusion coefficients, consistent with acute thromboembolic events. All areas of restricted diffusion were ipsilateral to the locations of balloon inflation. In procedure 2, an ischemic lesion of approximately 2 cm in diameter was noted in the area of the right SCA. In this case, SCA thrombosis was detected during the procedure; however, it did not respond to thrombolysis. In procedure 7, bilateral cerebellar ischemic lesions were noted in the area of the left (5 mm) and right (2 cm) SCAs. In this case, there was no evidence of any thromboembolic event during the procedure. Likewise, angiography performed after the procedure did not indicate any thromboembolic events, despite the fact that the bilateral SCAs were open. In this case, we assumed that a small emboli that could not be detected on postprocedural angiography was the probable cause of the lesions observed on DW images. In procedure 14, bilateral ischemic lesions were noted in the area of the left (15 mm) and right (10 mm) SCAs. In this case, thromboembolic events were noted in the right SCA during the procedure, and thrombolysis was performed. In procedure 20, there was no evidence of any thromboembolic event during the procedure, and none were detected with angiography after the procedure. However, multiple scattered ischemic areas in the deepest portion of the sulcus were noted in the area of the middle carotid artery, and a small ischemic lesion was detected in the left basal ganglia. In discriminant (stepwise) analysis, the size of the aneurysmal neck was associated with the occurrence of ischemic lesions on DW images (P < .05). However, the frequency of new hyperintense lesions detected on DW images was not significantly associated with the diameter of the aneurysm fundus (P > .05) or the fundus-to-neck ratio (P > .05). Balloon-related factors, such as maximum single balloon inflation time, total balloon inflation time, frequency of balloon inflations, and time the microballoon remained within the parent artery, were not significantly associated with new ischemic lesions on DW images (P > .05). The frequency of new ischemic lesions detected on DW imaging was strongly influenced by the number of times the microcatheter or coil was repositioned or removed (P < .01). The number of coils used did not influence the occurrence of cerebral ischemic lesions (P > .05). The most frequent and serious complications associated with conventional GDC embolization are ischemic lesions due to thrombosis of the parent artery or embolic phenomena. Thromboembolic events ranging from transient ischemic attacks to major strokes occurred in 1–28% of the cases in several clinical series (2, 5, 11, 13, 16, 17). These studies defined complications as new focal deficits, a change in mental status, or abnormalities detected on the postprocedural CT or MR examination. Pelz et al (13) have suggested that thromboembolic events resulting from GDC embolization procedures may be even more common than previously reported in the literature. In their experience, thromboembolic events associated with conventional GDC embolizations occur at a frequency of 28%, with persisting deficits affecting approximately 5% of patients. Advanced imaging techniques promise to provide additional information about the relationship between endovascular embolization techniques and thromboembolic events. Using a transcranial Doppler sonographic monitoring system, Kloetzsch et al (18) determined that microemboli occurred more frequently in patients with symptomatic cerebral ischemic events (71%) than asymptomatic ones (21%) after endovascular embolization. DW imaging provides potentially unique information about cell swelling due to ischemia. It offers image contrast that is dependent on the molecular motion of water, which may be substantially altered by disease (19). DW imaging is generally recognized as the diagnostic procedure most sensitive to the detection of ischemic cerebral events (19). Abnormal results can be observed on DW imaging within 40 minutes of the onset of the ischemic event (19). Conventional CT and MR imaging cannot reliably depict infarctions at the earliest possible point, and they are not helpful in differentiating acute, new, subacute, and chronic ischemic lesions. A few reports concerning the role of DW imaging in detecting thromboembolic events associated with GDC embolization have appeared in the literature. Biondi et al (15) reported that two of 20 patients had new lesions detected with DW imaging. The rate of thromboembolic complications in this study was 10% (two of 20). Rordorf et al (12) detected embolic infarctions that were related to the coil placement procedure in eight (61%) of 14 patients, and more recently, Soeda et al (14) published results in which DW imaging showed hyperintense lesions in 40 (61%) of 66 patients, with 16 patients (40%) eventually developing neurologic deterioration. These highly variable results suggest unpredictable rates of thromboembolic complications associated with GDCs. Theoretically, balloon-assisted embolization techniques increase the likelihood of thromboembolic complication for several reasons. The introduction of two guiding catheters and two microcatheters in the same artery, the temporary occlusion of the parent artery, repeated inflations and deflations of the balloon, and the necessity of a substantial amount of treatment material (coil packing) being exposed to the bloodstream all contribute to the perception that balloon-assisted techniques carry a risk greater than those of embolization techniques without balloons. Some authors have suggested that balloon-assisted techniques cause ischemic lesions more frequently than conventional GDC treatment (10, 11). However, others, such as Moret et al (5) and Lefkowitz et al (9), have reported lower rates of thromboembolic complication when balloon-assisted techniques are used. Derdeyn et al (6) found no exact relationship (P = .18) between balloon-assisted techniques and thrombus formation originating at the location of the coil mass and spreading into the parent or branch arteries during GDC procedures. Soeda et al (14) investigated thromboembolic events associated with coil embolization with DW imaging. They reported that thromboembolic complications were more common in procedures utilizing balloon-assisted techniques than in procedures using conventional GDC techniques (73% vs. 50%). With the exception of this study (14), we are not aware of any other report regarding the detection of thromboembolic events with DW imaging. The widely varying results of published studies investigating the rate of complication associated with balloon-assisted techniques have generated a debate about the safety of this procedure compared with conventional GDC techniques. The paucity of studies about the role of DW imaging in detecting thromboembolic complications makes it impossible to resolve this debate at this time. DW imaging depicted thromboembolic events associated with balloon-assisted embolization in 20% of our cases. This rate of complication is significantly lower than the rates reported by Soeda et al (14) and Rordorf et al (12) (61% in both cases). However, it is slightly higher than the 10% rate of complication reported by Biondi et al (15). Every aneurysm in our patient population was embolized with a balloon-assisted technique, suggesting that balloon-assisted techniques do not carry a thromboembolic risk greater than that of conventional GDC treatments. Soeada et al (14) reported that hyperintense lesions are detected in 73% of balloon-assisted procedures and only 50% of conventional GDC procedures. Furthermore, when the rate of ischemic lesions in their study was examined for aneurysms that were both wide-necked and large, the frequency was 100%. Because our study included only aneurysms that were wide-necked or that had a poor fundus-to-neck ratio, our rate of ischemic events appears to be even more prominently lower than that in the study by Soeda et al, in which some aneurysms were considered small or small necked. Padolecchia et al (20) and Han et al (21) investigated the role of electrothrombosis in embolizations performed with GDCs. They speculated that the application of electrical current could trigger an early and enhanced thrombotic reaction that could protect the aneurysm from early rebleeding and encourage the formation of mature, intra-aneurysmal scarring. However, electrothrombosis could also have a negative effect by stimulating thrombus formation and subsequent thromboembolic complications. These authors also showed that thrombus formation at the detachment zone occurred even in canine carotid arteries in which the arterial blood flow was preserved. The frequency of thrombus formation reported in these studies suggests that thrombi might form during treatment, as well as immediately after coil detachment. Blood clot that forms during the detachment process around the detachment zone or around the coils can be distally embolized during withdrawal of the pusher, repositioning of the microcatheter, or repositioning or removing the coil. Our results suggest that multiple microcatheter repositioning procedures and coil removals are strongly associated with the occurrence of ischemic lesions secondary to thromboembolic events. Because multiple GDCs are already within the aneurysm and because clots are present within the aneurysm, we believe that repositioning or removing microcatheters or coils poses a considerable risk during the deployment of GDCs into the region of the aneurysm neck. Our results do not support the idea that balloon-assisted embolization techniques are riskier than conventional embolization with GDCs. Balloon-related factors, such as the number of balloon inflations, the maximum single inflation time, the total inflation time, or the time that the balloon remained in the parent artery, were not significantly related to the occurrence or frequency of thromboembolic-ischemic events. One procedure is especially illustrative: In procedure 11, the balloon was inflated below the polygon of Willis within the ICA. The longest single inflation time in the ICA was 378 seconds (7 minutes 18 seconds). The total inflation time was 31 minutes 6 seconds, and the microballoon was inflated 20 times. This patient experienced no thromboembolic or ischemic event despite these presence of supposedly risky balloon-related factors. In our study, 75% of the ischemic lesions related to the embolization procedure were detected in the posterior circulation, distal to the BA. Aneurysms occurring in the SCA were especially likely to be associated with thromboembolic events during GDC embolization procedures. Soeda et al (22) used DW imaging to investigate the incidence and radiologic appearance of thromboembolic events during GDC embolization of asymptomatic BA bifurcation and BA-SCA aneurysms. New hyperintense lesions were observed in 18 patients (69%), with seven (27%) eventually developing neurologic deterioration. These investigators evaluated 21 BA bifurcation aneurysms and five SCA aneurysms. Ischemic lesions were detected in 16 of the BA bifurcation aneurysms and two of the SCA aneurysms. Although we did not detect any ischemic lesions in the two basilar bifurcation aneurysms investigated in our study, we did detect ischemic lesions in three of five SCA aneurysms. Overall, the rate of ischemic lesion occurrence was three (42.8%) of seven aneurysms in the posterior circulation and one (7.6%) of 13 aneurysms in the anterior circulation. Occlusion of the orifices of side branch arteries (ophthalmic artery, anterior choroidal artery, PCoA) during balloon inflation in the ICA does not seem to result in any thromboembolic or ischemic events, possibly because of the existence of collateral pathways. Examples of these include the posterior choroidal arteries that communicate with the anterior choroidal artery; the external carotid artery branches communicating with the ophthalmic artery; and the communications among the PCoA, the P1 segment of the PCoA, and other arteries in the Willis polygon. Several theories concerning the reasons for the potentially greater risk of thromboembolic complications associated with balloon-assisted techniques have been presented. However, reasons for the decreased incidence of such complications when balloon-assisted techniques are used, as in our study, remain relatively unexplored. We believe that thromboembolic events are less likely to occur when balloon-assisted embolization is used because of the ability of the balloon to stabilize or “plaster ” the clot formation toward the fundus during each coil deployment. In addition, the microcatheter is always withdrawn at the end of the procedure while the balloon is inflated. If a clot were to form at the tip of the microcatheter, the balloon would keep this clot within the coil mash, thereby preventing it from migrating distally. Finally, the balloon can potentially eliminate or decrease the number of microcatheter or coil maneuvers during the procedure. All of these factors could be considered advantages in terms of safety when balloon-assisted techniques are compared with conventional embolization with GDCs. Further studies are required before any definite determination can be made. Our study has several limitations that require discussion. The number of aneurysms evaluated was relatively small (n = 20). A larger patient population should be evaluated to further investigate our initial results. In general, thromboembolic events do not frequently occur as a result of embolization procedures. The available sample was small, and it is possible that other factors unknown to us were the true causes of the thromboembolic events that affected our patients. Our study could also be improved with the addition of other patient groups. Using DW imaging, we evaluated only patients who underwent balloon-assisted techniques. A comparison of these patients to others who undergo procedures with balloons and GDCs, conventional GDC treatment alone, and different types of coils (other than GDCs) would likely allow for a more definitive evaluation of the techniques in terms of their relative safety and appropriateness for various types of embolizations. Finally, we were unable to perform DW imaging before the procedure to determine the presence of any preprocedural thromboembolic events. In our experience, the risk of thromboembolic events during the treatment of intracranial aneurysms with balloon-assisted techniques is not greater than that of conventional GDC techniques. The only variables found to influence the risk of thromboembolic events during or after balloon-assisted coil placement were the number of times the microcatheter or coil was repositioned or removed and the size of the aneurysmal neck. The authors express their gratitude to the entire staff of our angiography suite for their hard work and diligence. Supported by the Research Fund of The University of Istanbul, Turkey.